I learned almost everything I know about programming outside the classroom. Anything about coding is online and free, it seems. Big-oh notation is an exception. I have yet to see an online explanation of this topic that’s great for learning — specifically, that expresses the idea both intuitively and precisely. This is my attempt to make it possible to learn about big-oh — and learn it well — online. I’m writing for programmers, so the focus is on applications to algorithms. It’s not so bad if you haven’t already mastered big-oh notation. Before I learned it, I thought it was a technique that elevated you to a status of Jedi master coder. This is not true. Like many tools, it’s useful in specific situations — mainly, whenever you want to carefully measure the time or memory efficiency of a difficult algorithm. I’ll use sorting algorithms as examples to show how the notation is useful. You probably won’t design new sorting algorithms — but you may want to design a particular function, class, or api with maximal efficiency. You may face code decisions where the trade-offs are not obvious, or difficult to describe precisely. This article explains tools that can help you write the best code in these cases. # We expect `numbers` to be a non-empty list of real numbers. How fast is this function? u(n) = 2n + 5. Both t(n) and u(n) capture the function’s running time — it would be nice if we could express them in a way that de-emphasized the minor differences in measurement methods. The function t(n) grows at a rate proportional to or slower than n, forgetting scalars, any constant term, and small values of n.
This is a mathematically vague and imprecise statement, but by the end of the post, the details will be filled in. I have a theory that people don’t really learn something until they use it to solve a problem.But you’re impatient, right? Just tell me the definition of big-oh, you say. But the definition alone does not provide deep understanding. So if you want to really learn this stuff, stick around to the end! It makes much more sense after seeing it used in a few examples. When used to describe algorithms, big-oh notation typically involves a positive integer value n that we think of as getting larger without bound — in math-speak, it is approaching infinity. The notation f(n)=O(g(n)) means that there are numeric constants C and N such that all values n with n > N must have |f(n)| ≤ C ∙ |g(n)|. That’s the mathematical definition. Let’s step back and see where that came from. Now for the intuition — big-oh is a way to express when certain functions are nicely ordered. Looking at graphs, it’s easy to feel that f(x)=x is somehow less than f(x)=x² or that f(x)=log(x) is less than f(x)=√x. The ordering is not exact — for example 1/2 > (1/2)², so that x isn’t always < x². Yet this ordering is true most of the time, and this vague phrase most of the time is given a mathematically precise meaning using the definition above. It’s nice to put functions in order since some functions can capture an algorithm’s running time — and we want to compare running times. We want to know when one algorithm is faster than another. Big-oh is not identical to the ≤ sign — it’s just intuitively similar. It’s true that n=O(n²), but we also have 3n=O(n), and n+100=O(n). Even though 3n > n, they are intuitively growing at similar rates; the same is true of n+100 and n. To see how n+100=O(n) fits the definition, plug in the values N=100 and C=2: as long as n > 100, we have n+100 ≤ n + n = 2n. In this way, big-oh allows us to forget about the +100 part of n+100 — but not the squared part of n² compared to n since they grow at such drastically different rates. Next we’ll see how this notation is useful for understanding algorithm efficiency; and before the posts ends, we’ll return to the definition to explore its personality. Suppose you want to choose between mergesort and a simple quicksort algorithm — which one is faster? This is a good question to learn from because the algorithms are intuitively clear, yet their analysis is not completely obvious. # Find left & right lists so left < pivot <= right. L < pivot ≤ R.
From here, left and right are recursively sorted to provide the full sort. # 1. 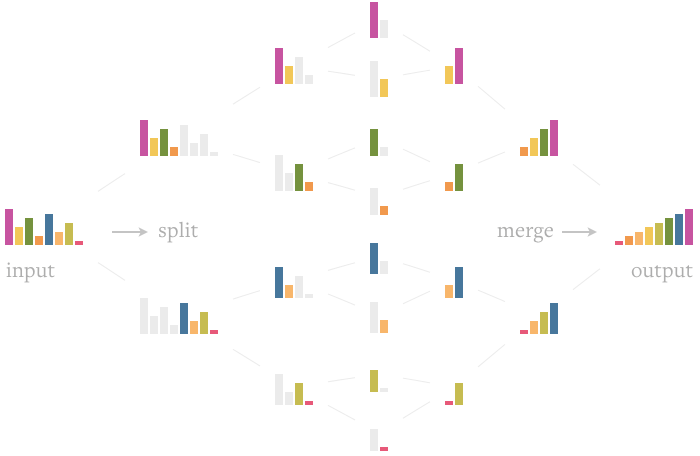 Split in half and recursively sort. This time, the array is split in half using a mid-point set at index int(n/2). These halves are recursively sorted, and a little work is spent merging them together to arrive at the fully sorted array. This is such a common problem that you might have the answer memorized. It’s worthwhile to pretend it’s a new problem to you, and to appreciate that the answer is not obvious at first glance. After all, the main application of big-oh notation for coders is to understand the behavior of new algorithms. if left[i] < right[j]:          # in mergesort. This unit of measurement is proportional to the total time each sort algorithm will take, is easy to measure experimentally, and is independent of any particular hardware it may run on. 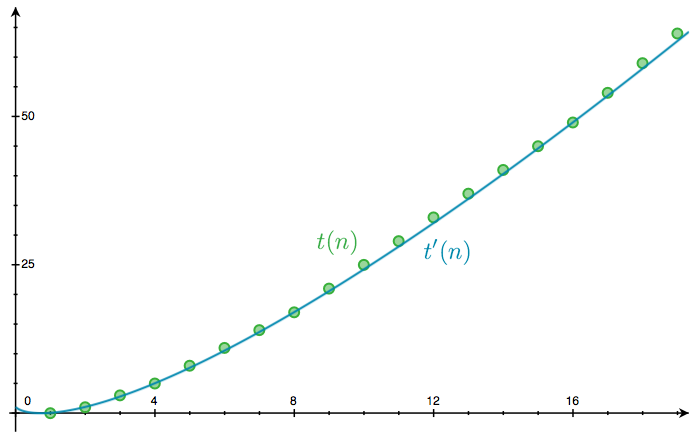 The graph below shows the number of comparisons needed to sort every possible ordering of [1, 2, 3]. The height of each blue bar gives the number of comparisons used for a particular input. 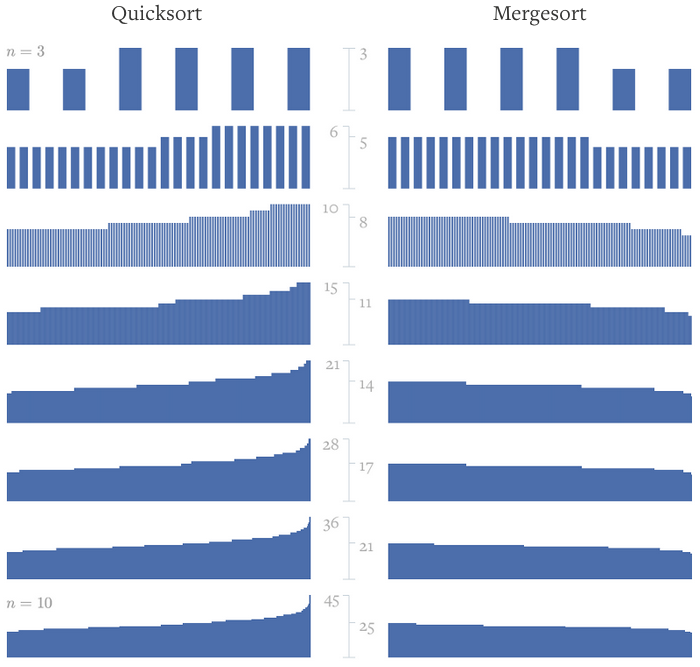 The input is represented by the smaller gray bars beneath the blue bar; for example, the left-most bar represents input [1, 2, 3] to quicksort taking 3 comparisons, while the right-most bar represents input [3, 2, 1] to mergesort. The n=3 label indicates the length of the input. 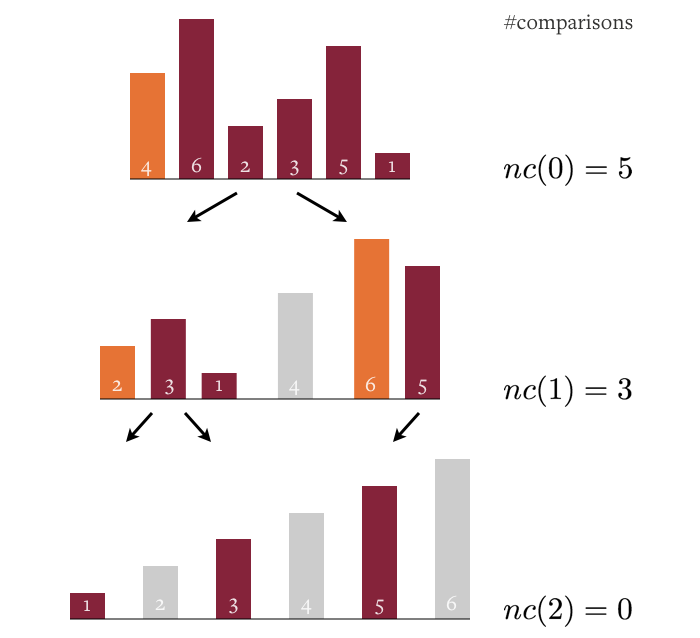 Both algorithms use either 2 or 3 comparisons in all cases — and neither one is clearly faster than the other for a random size-3 input; they both use 3 comparisons on 4 possible inputs, and 2 comparisons on the others. In this graph we can see that mergesort’s slowest case — the maximum number of comparisons—is better than quicksort’s slowest case. Usually we won’t know the length of the input array ahead of time. With this in mind, we can look for a pattern by extending the above graphs for several larger values of n. For an input array of size n, there are n! 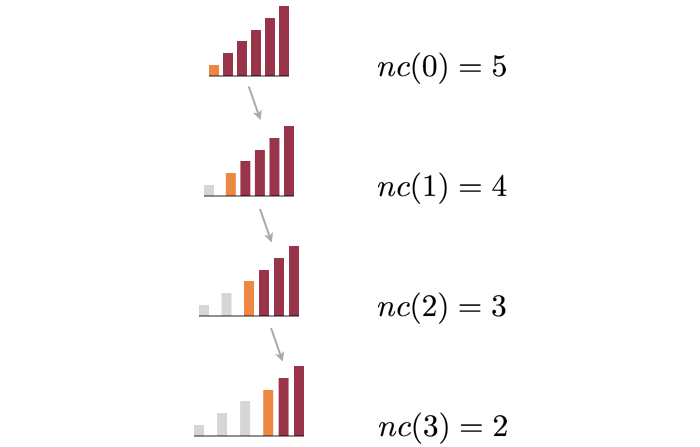 different array orderings — that is, n(n-1)(n-2)…1 possibilities. The bars in the next graph are drawn in order of height since otherwise they’d be difficult to visualize. The last row, with n=10, represents 10! = 3,628,800 different array orderings, so the graph is a compressed but accurate representation. Something curious is happening in the quicksort column: a little spike has been forming, pushing up the maximum number of comparisons. 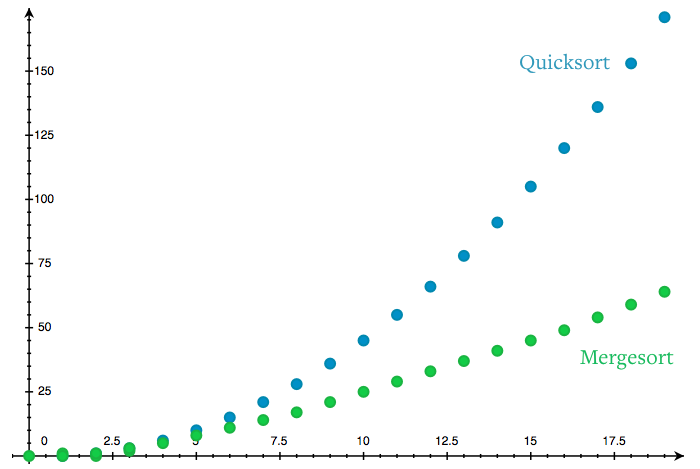 The earlier bar graphs made it look as if quicksort was often about as fast as mergesort. Suddenly, this last graph is making quicksort look much worse. What’s going on? Let’s dive into precise terminology for general algorithms — we’re ready to define the time complexity of an algorithm. It’s nice to have a single function t(n) that expresses the time an algorithm takes in terms of n, the size of the algorithm’s input. It’s often true that there are many inputs of a single size — for example, many lists with the same length — so we have to decide how to represent all the running times for these inputs with a single number. is called the worst-case time complexity of an algorithm because it assumes the slowest possible performance based on knowing n.
An alternative to worst-case is the average-case time complexity, which instead measures the average number of time units used for a random size-n input. The bar graphs above were made by running the algorithms on many inputs. This only works for finite n. Let’s try to find an expression for t(n) that doesn’t require any code to compute. Below is an example of a quicksort run on input [4, 6, 2, 3, 5, 1]. The orange bars are pivot elements; gray bars separate different input sets in the recursive calls. The new variable nc(k) is the number of comparisons performed at each recursion depth k.
A recursive call with input s uses len(s)-1 comparisons, excluding comparisons made indirectly with deeper recursive calls. So nc(k) is the sum of len(s)-1 over all sublists s at that depth. ns(k) = #sublists at depth k.
nc(k) = ne(k) - ns(k). This works because, at depth k, there’s one comparison per non-pivot element. And there are ns(k) pivot elements, so subtracting ns(k) from ne(k) gives us the number of non-pivot elements. nc(k) = nc(k-1) - ns(k). Our goal is to find the maximum #comparisons used by a run of quicksort — that is, the maximum sum of nc(k) over all recursion depths k. This last equation tells us that maximizing nc(k) is the same as minimizing ns(k), so let’s consider the smallest possible values of ns(k). If ns(k)=0, then nc(k)=0 since no comparisons are done when there are no sublists. So the maximum value of nc(k) is nc(k-1)-1, which happens when ns(k)=1. This last example gives the maximum #comparisons for any input of length 6. So t(6) = #comparisons on [1, 2, 3, 4, 5, 6] = 5 + 4 + 3 + 2 + 1 = 15. This formula gives us the exact worst-case time complexity of quicksort. Not only did we find quicksort’s speed on already-sorted inputs, but we also carefully argued that no input could use more comparisons. # 2. Merge together (left/right have been recursively sorted). A merge ends when either left or right runs out, triggering one of the last two lines of the while loop. Until that happens, one element is appended to sorted for every comparison. At most len(arr)-1 comparisons happen during a merge, corresponding to a single element remaining in either left or right when the merge ends. Can this theoretical maximum actually happen at every recursion depth for a single input? The answer turns out to be yes — but we need to do some work to prove it. We’ll construct slow-to-mergesort arrays using a function called antisorted. It works by choosing exactly which elements will end up in the left and right subarrays so that, during a merge, the smallest element is chosen from right, then from left, then from right, etc. The right side is filled first in the loop since, when n=len(arr) is odd, right has one more element than left in a run of mergesorted. The last line of antisorted makes sure that every recursive level of mergesorted also uses a maximal number of comparisons. We can mess with the ordering of elements within left and right in the last line of antisorted because, by the time the merge starts during mergesort, all recursion is done, and left and right have been restored to their sorted selves. Antisorting maximizes the number of comparisons done at all recursion levels. As a result, the maximum total comparisons is exactly the sum of len(arr)-1 over all recursion levels. We can summarize this result with the recurrence relations below. The left pair of brackets around n/2 mean to round down, and the right pair mean to round up, like the floor and ceil functions. This is a nice way to handle both even and odd values of n in one equation. Sadly, it’s not easy to turn this into a nicer, non-recursive expression. For now we’ll deviate to an approximation t’(n) based on the picture below, where each horizontal layer indicates a recursion level in a mergesort. This picture introduces the function lg(n) which is the base-2 logarithm of n.
Each blue bar represents a portion of the array being considered by a mergesort call; the values like n or n/2 give a size estimate for the input to that mergesort call. This estimate won’t be accurate whenever the previous call has an odd-sized input, and our value of h is clearly wrong when lg(n) is not an integer, but this picture can still give us some intuition about how many comparisons are occurring. Unfortunately, we have no careful proof of a connection between the approximation t’(n) and the exact function t(n). Can we regain proven information about mergesort without having to solve the above recurrence relation? The motivation for big-oh notation has just ambushed us. It’s perfect for our mergesort analysis — it gives us a way to briefly summarize t(n) without finding a non-recursive expression for each value. At each recursion level of mergesort, all of the n elements have been split up into sublists to be sorted. So the number of comparisons at any fixed level is always ≤ n.
By the time k=lg(n), the longest sublist is < 2. So no comparisons can occur after recursion level h=lg(n). Next let’s find a big-oh expression for quicksort’s t(n). By this measure, mergesort is the clearly superior algorithm. However, there are slight modifications to quicksort that can improve its speed in some cases, and I’ll mention one below. It looks like the worst-case for quicksort is isolated to a small subset of inputs. It would be nice if we could give quicksort some credit for being as good as mergesort most of the time. Average-case complexity allows us to overlook slow-but-rare inputs. An interesting technical question pops up: What is the probability distribution on the inputs? For example, for a string algorithm, should we consider all valid UTF-8 strings as equally-likely inputs — or are natural language strings more likely? The definition of average-case complexity doesn’t specify your probability distribution. In other words, it’s up to you to choose the distribution that makes the most sense, though it’s common to assume that all inputs of the same size are equally likely. For sorting inputs of size n, we can use permutations of 1, 2, …, n to represent each possible ordering of an input, and treat each permutation as equally likely. With that distribution, the average-case time complexity of quicksort is O(n log n), though it’s a bit of work to figure that out. Quicksort’s average time is O(n log n), but it’s still slow on presorted input. This can be a problem in practice. An easy improvement is to choose the pivot element randomly. arr, arr[pivotIndex] = arr[pivotIndex], arr  # Item swap. Now the running time on any input — including a presorted list — is itself random. Well, pseudorandom in practice. Since the running time is random even for a fixed input, it’s reasonable to look at the expected running time. In other words, t(n) now represents an simultaneous average over both all length-n inputs and all possible pseudorandom parameters — in this case, our pivot choice. In the case of random-pivot quicksort, the expected running time is the same as the average-case time for the non-random version — O(n log n). We’ve talked about two probabilistic ideas so far: averaging over many inputs, and about algorithms using random parameters. A third variation of average-case complexity is amortized analysis, where averages are taken over a group of consecutive function calls. In this section, we’ll use the variable n to indicate how many add calls have already occurred. Since we didn’t bother to make a remove function, this means there are exactly n integers stored in the array. Adding an element to a full, no-extra-space array with n elements requires n+1 memory writes, which is our measure of time here. In other words, a single add call could take arbitrarily long, even though it has only one fixed-size input! Let T(n) denote the number of memory writes used in n consecutive add calls. We can summarize the last result as T(n) ≤ 3n. which we could phrase like so: The amortized running time of add is constant. It’s called constant time because the equation t(n) = O(1) means there must be some constant C so that t(n) is always ≤ C for all n after a certain point. Now we’ve seen a few key examples of how big-oh can be used, as well as explored different ways of choosing a single value t(n) that represents an algorithm’s efficiency. Let’s step back and review some general properties of the notation. Big-oh notation cuts away the cruft of a function to identify the piece that best captures growth as n goes to infinity. The right-hand side is a great simplification of the growth of the left-hand side. which is technically true, but completely misses the point of big-oh. There’s a spirit-of-use behind big-oh notation. When we write f(n)=O(g(n)), we also mean that g(n) is the best — smallest and simplest, intuitively— function that we can prove works. So writing n=O(n²) is true, but weird because n² is clearly not the smallest function that would work inside the big-oh. Now is a good time to ask: Do you see the flaw in the logic below? Therefore, in worst-case terms, mergesort is faster than quicksort. To drive the point home, this line of argument is like saying x≤3 and y≤4, therefore x ≤ y. Yet clearly we could have, say, x=2 and y=1. This is a weak point in the traditional usage of big-oh notation. There are actually other letters which can be used for other function comparisons. The notation f=O(g) is sometimes written when in fact f=θ(g) is known. therefore, mergesort is faster in terms of worst-case complexity. The moral is to avoid using big-oh notation to say an algorithm is at-least-as-slow-as a function. Technically, big-oh only provides at-least-as-fast-as guarantees. Theta or big-omega notation can be used for other guarantees. A few common functions have specific names in the context of big-oh notation. As usual, suppose t(n) is the time complexity of an algorithm. This section uses a bit more math than before, including some limits and a few formal logic symbols. If you want to skip this for now, please jump down to the big picture section for continued limit-free fun. There are a couple equivalent ways to define the expression f(n)=O(g(n)). The sup stands for supremum, and indicates the least upper bound on a set of numbers. which is an even more elegant expression. Big-oh notation has its peculiar flavor of inelegance, though. It does something horrible and drastic and freaky — it redefines the equal sign. Using the traditional meaning of the equal sign, the argument below would be logically sound. Obviously not, though. As soon as big-oh shows up to an equation party — or its cousins theta, omega, etc — the equal sign loses symmetry and acts more like a < sign. This is a weird thing to do that feels to me like a notational mistake. But it’s stuck with us as an established standard. Let’s see some examples around the limit point L=0. Decide what unit will be measured. For example, time or memory used based on the size of an input. Summarize values across all possible size-n inputs. For example, worst-case or average-case analysis. The previous two decisions are independent of big-oh notation. Once we have a function like a worst-case time complexity t(n), we’re ready to look for a big-oh expression for t(n). There is no recipe to accomplish this. Sometimes it’s easy and other times you’ll have to be creative depending on the complexity of the algorithm. We don’t ever have to find an exact expression for t(n). We didn’t when we studied t(n) for mergesort. Skipping that step, while still gaining understanding of t(n), is a big advantage of using big-oh notation. To wrap up, let’s take a critical look at what’s good and bad about big-oh notation. in which case it would be embarrassingly understated to note that the t-algorithm is faster than the u-algorithm. When applied to the analysis of algorithms, t(n)=O(g(n)) often means either t(n)=θ(g(n)) or something nearby like “t(n)=O(g(n)), and this is the best-known bound.” Sadly, this is easily confusing because it results in people using big-oh like theta, when what is written down is a statement with less information. which are otherwise hard to describe. Thanks, big-oh! I originally learned the fundamentals of algorithmic analysis through a textbook accompanying a college class on the subject. That book is Introduction to the Theory of Computation by Michael Sipser, and it’s a great book. It’s easy to read, doesn’t omit technical detail, and covers a good set of topics in the theoretical foundations of computer science. However, I think the single best source for this material is Concrete Mathematics by Ronald Graham, Donald Knuth, and Oren Patashnik. I have the 2nd edition, in which chapter 9 covers big-oh notation in great detail with useful subtopics and fun exercises. This book is another personal favorite. If, like me, you find yourself wondering purely mathematical things such as — Just how fast can functions grow? Are all functions linearly ordered by big-oh? — then I highly recommend Orders of Infinity by G.H. Hardy. This is an older book written in 1910. Despite the book’s age, it’s surprisingly readable and filled with delicious, mathy morsels. If you enjoyed this post, please follow the Of Games and Code collection! Precisely describe all arrays that require the maximum number of comparisons in our quicksort implementation. Find a big-oh expression for the running time of the antisorted function. Find an non-recursive expression for our mergesort’s worst-case time complexity t(n). Prove that the different definitions of f=O(g) given above are equivalent. I used LaTeXiT to generate the math images, followed by some minor post-processing in Photoshop and Keynote. Several of the sorting algorithm graphs were generated with custom Python scripts utilizing PyCairo for image generation; this code is open source here. Thanks to Jean Hsu, Scott Cameron, Adam Luikart, and Mike Sall. Machine learning engineer; math for fun.